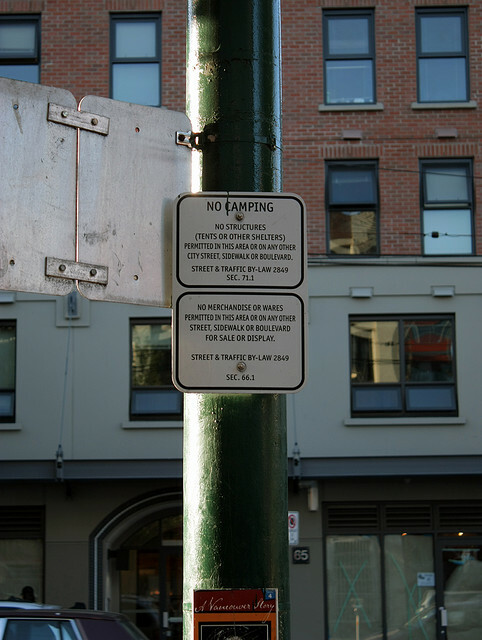 Many occupiers have wondered about the city’s Street & Traffic By-Law 71.1, posted on city signs throughout the Art Gallery grounds. The purpose of this article is to give information and analysis about the By-law and its impact on #occupyvancouver. “NO CAMPING: No structures (tents or other shelters) permitted in this area or on any other city street, sidewalk or boulevard. Street & Traffic By-Law 2849 Sec. 71.1.” While these words read like eternal declarations, seemingly handed down to us from the founding laws of our colonial state, the reality is that they are recent history — very recent. This past April, Vancouver’s city council and Mayor Robertson passed amendments to Section 71 and other sections of the Street & Traffic By-Law that seriously restrict protest in public space. The April meetings of city council were called for legal reasons. In October 2010 the By-Law had been ruled unconstitutional by the BC Courts, who gave the city six months to change it. On April 7th 2011, council presented its new edits to the public. According to the new version of the By-Law, political structures remained illegal except with a special permit, which could be purchased at a cost of $200 plus a refundable deposit of $1000. The Mainlander pointed out that under the new By-Law, “no structures would be allowed before 8am or after 8pm, eliminating the possibility for extended protests.” The amendments were unanimously rejected by the public, including the the BC Civil Liberties Association, Pivot Legal Society and the Vancouver Public Space Network. Anyone who witnessed on 19 April 2011 the seven hours — all morning and all evening — that Vancouver City Council spent cobbling together last-minute amendments to Vancouver’s Street and Traffic By-law (reference Agenda Item 1) should have an excellent idea of how bureaucracy cannot cope with freedom. 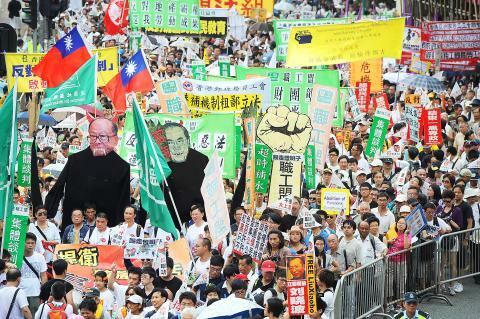 More than two weeks earlier on April 7, the issue of “Structures on Streets for Political Expression” had already eaten up an entire afternoon. By one well-placed account, the contentious report first appeared online and available to the public at 1:30 pm on Tuesday April 5. Report presenter Peter Judd made several apologies for the lateness of a document that the City had had more than five months to prepare. The public had only 48 hours of lead time. The five speakers heard on that first afternoon included Clive Ansley, legal representative for Falun Gong, and Micheal Vonn of the B.C. Civil Liberties Association. 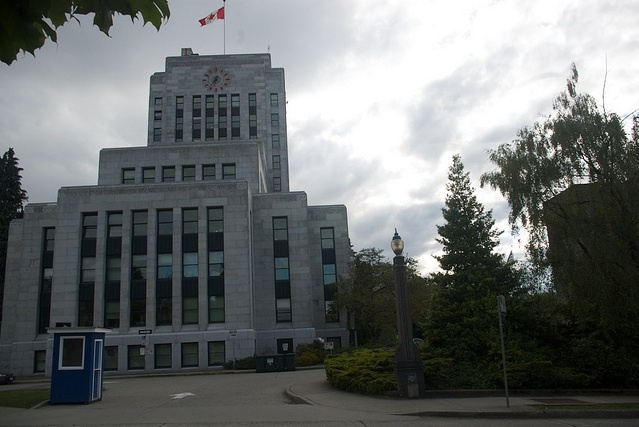 Despite the generality of the bylaw amendments proposed, the report to council (amended version) made clear a desire “to align with direction provided by the B.C. Court of Appeal in the matter of the Falun Gong.” The elephant in this bylaw closet was the ongoing protest outside the Chinese consulate on Granville Street. The bylaw amendment itself adopted a cumbersome and much vaguer designation to generalize its effect and coverage. 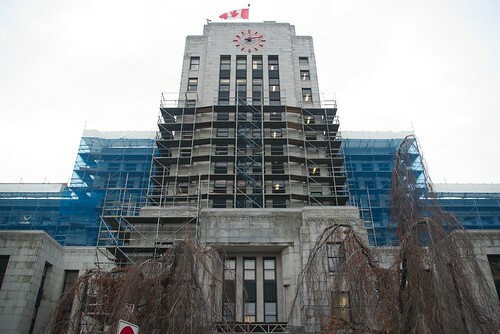 Vancouver’s in-control municipal party, Vision Vancouver, votes as a bloc. You’re surprised? Parties exist to march in step. They call it discipline. The just updated Vancouver Council Votes web site covers 39 of the most contentious issues to come before City Council 2009-2011. Most of the contention surrounds “planning” — aka spewing out turgid bureaucratic justifications for handing over as much as possible as fast as possible to the local real estate speculation industry. What else is a poor city to do when so much of its economic base has slunk off to elsewhere? On four separate occasions, four different Vision councillors have strayed. First, a roll call of the rigid toers of the line: Heather Deal, Kerry Jang, Gregor Robertson, Tim Stevenson. Now to inspect the anomalies. George Chow on 24 September 2009 opposed the form of development slated for 1450 McRae Avenue. No coincidence — Chow has strong connections to Shaughnessy. (When the earlier main vote took place on 1 April 2008, Chow with Deal joined NPA’s Capri in opposing the sizeable McRae development at the edge of that special region.) Four sessions of previous public hearing saw 53 persons speak in opposition and 7 in support. On the correspondence side, 4 letters supported and 427 opposed. Amusing side note: one of the speakers in opposition back then, Tony Tang, is now the 2011 Vision replacement for George Chow. Andrea Reimer on 18 May 2010 opposed the rezoning of 2250 Commercial Drive (Van East Cinema). Reimer lives to the south of that location. The developer proposal involved outrageous fudging, perhaps too much for Reimer to stomach. Chase the details on that 2250 Commercial rezoning if you need a purgative. WHY RIOT IN THE BEST PLACE ON EARTH? 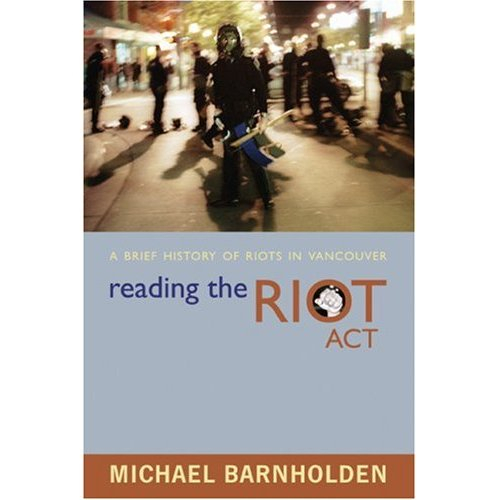 Michael Barnholden, author of Reading the Riot Act: A Brief History of Rioting in Vancouver (Anvil Press 2005), is associate director of Humanities 101 at the University of British Columbia, member of the board of the Kootenay School of Writing, and managing editor of the literary magazine West Coast LINE. I have to admit I was taken by surprise. When asked if there would be a riot after game 7 of the Stanley Cup final I said: “No, conditions just aren’t right, there’s not enough anger out there.” The anger I was referring to would be the anger directed at the police and the government, in short, the authorities. I was wrong. It seems there was no shortage of anger. But then, I also thought the Canucks would win the cup. For me the question that remains is what is the source of the anger? I don’t buy the theory that losing a game results in such rage. The bad apple theory doesn’t hold water nor does mob mentality. Too many bad apples not enough mob. So where does the rage come from? Here’s my theory. BC has just come through the most vicious ten year cycle of class warfare waged by the BC Liberal government under Gordon Campbell and the election of a new leader in the person of Christy Clark promises more of the same in a new style. What is the evidence? After the Stanley Cup riot of 1994, a Georgia Straight article, titled “Stupidville” pondered: “[Vancouverites] had better decide what we want this community to be about, besides pretty vistas when it doesn’t rain. What shared tasks can we undertake whose achievement will fill us with civic pride? What conditions are needed to come to unconditionally love this place, not for where it is, but for what it is?” But after 15 years of more pretty vistas and nature fetishism, we have failed to produce “something nobler than a mob heading to Stupidville,” as the Straight hoped. Many of tonight’s rioters were toddlers during the previous riot, so they cannot possibly be blamed for both. Although each fanatic must face their own responsibility for being swept up in the tide of jingoism, the system that produces Canuck fanatics goes back decades. It is important to analyze this system of fanatic production, in order that “something nobler” emerge one day. First it is impossible to have fanatics without spectacle. Tonight, we had two spectacles: the spectacle of the Canucks, then the spectacle of the Rioters. Disappointed fanatics, unable to control the outcome of the hockey game, created a spectacle of their own. Meanwhile, sitting at home, you could consume representations of both, without having power over either. It is often claimed that fanatics turn to hooliganism to compensate feelings of powerless when their team loses, and express their powerlessness through violence. There is truth to this, but there is more: they overcome their powerlessness through spectacle. It helps to recall that our late-capitalist society is a “society of the spectacle,” where social life is increasingly mediated through representations – corporate media and advertising. We acquire collective experience, and even collective purpose, by gazing at these representations. 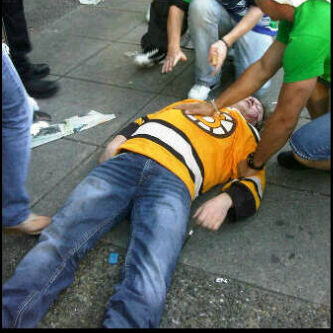 And in Vancouver, the gaze has been professionally focused on ‘our boys’ fighting the enemy – the Boston Bruins.